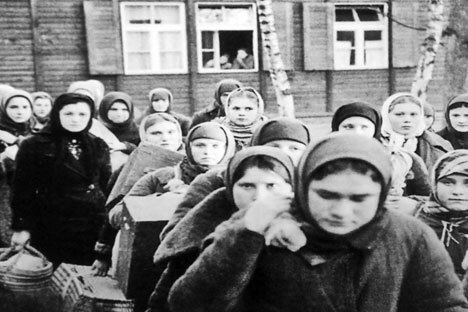 A documentary featuring interviews with some of the last women to live through the Soviet labor camps is nearing completion. Two years after completing a Kickstarter campaign to fund their documentary Women of the GULAG, director Marianna Yarovskaya and historian Paul Gregory are finalizing the shooting of the film. The project grew out of Gregory’s seminar on totalitarian regimes at Stanford University, where he is a fellow at the Hoover Institution. Steven Spielberg’s Shoah Foundation, which conducts interview with the last Holocaust survivors, was discussed as part of the seminar, which gave Yarovskaya, an American of Russian descent, the idea of filming GULAG survivors. "For Russia," said Yarovskaya, "massive repressions are a more vital part of history than the Holocaust. And yet, in the center of Moscow there is still no major museum or monument in honor of the victims. I'm astounded by the absence of a global repentance." Gregory, Yarovskaya’s partner in the project, played an important role in focusing the subject matter of the film to female victims of the GULAG. A professor of economics at the University of Houston as well the director of the Hoover Archives Workshop on Totalitarian Regimes, Gregory is the author of the book Women of the GULAG, which tells the stories of some of the same women as the film. Yarovskaya’s family was influenced by Stalin's repressions. Her grandfather was an actor at both the MKhAT-2 Theater and Lenfilm Studios. He spent several years in a labor camp 60 miles outside of Leningrad because he adhered to an "incorrect political line." When he was released from the camp, he was allowed to play only negative characters, particularly "enemies of the people." When World War II broke out, he volunteered to go the front was killed in the first days of the war. Gregory's father fled to the Harbin, China, just across the border from Russia, when the Red Army entered the Siberian city of Chita after the 1917 Revolution. "In the archives of the Hoover Institution I saw Stalin's decree 'On the Return of the Harbinites,'" Gregory said. "Upon return, they were all executed. It could have happened to my father, had he, like many Harbinites, accepted Stalin's invitation to return to Russia and build Socialism." Much material on the GULAG is preserved in the archives at Hoover. Yarovskaya and Stanford historian Natalya Reshetova worked both there and in Moscow at the archives of Russian NGO Memorial and the Sakharov Foundation to locate the heroines for the film. Stanford also provided the initial funds for the film. Yarovskaya and Gregory later raised more money via crowdsourcing. "We received tens of thousands of dollars from people living in Russia, in the former Soviet countries and in Eastern Europe. The people who donated the most money were Russians and Russian speaking workers at Google," said Yarovskaya. The following year, the project received the National Endowment for the Humanities grant Bridging Cultures Through Film. Academy Award winning filmmaker Mark Harris and Mitchell Block, who has been the executive producer of Academy Award winning films, came on board as producers of the documentary. There are five main stories in the film. One of the featured women is Alexander Solzhenitsyn's former secretary Nadezhda Levitskaya, who spent a total of nine years in prisons and camps. Another is a peasant from the Urals, Fekla Andreeva. In the fall of 1931 Fekla’s family were classified as kulaks, a kind of affluent famrer, and moved into the GULAG forced settlement system. They were declared "enemies of the people" and taken from their village of Suvory to a birch forest with other displaced people and left there in a cold dugout. In 1938, Fekla’s father was arrested and executed. At their last meeting, he told her: "I just want you to do one thing: get an education. Because it's more difficult to squash an educated person." Fekla took his words to heart. After receiving her doctorate, she devoted her life to rehabilitating victims of the repression through the judicial system. She wrote letters to various courts, and was instrumental in the rehabilitation of 419 people. Another of the heroines, the pianist Vera Hecker, was arrested simply because she had a German surname. In 1941, the 19-year-old was sentenced to five years in the camps. Her music teacher tried to defend her; she came to the Soviet secret police, the NKVD, and said, "Look at you, you're surrendering towns but chasing girls." The teacher was also arrested and sentenced to a camp in Udmurtia, where she died. "People were broken," said Yarovskaya. "The will to resist was eliminated in them, as well as in the generations to come. This has remained in the nation's gene pool and will be there for a while. If you resist, you'll perish… I can see how their destinies have been shattered, how painful it is for them. One thing is to survive; another is to build a happy life. Many of them don't have children, don't have families. These women's lives were broken, and no one has apologized to them yet - for the lost youth, for the suffering, for the executed parents."